IT'S simple math - two of Australia's most popular rock bands for the price of one is going to result in a sell-out joint national tour. The Silverchair/Powderfinger Across the Great Divide dual juggernaut rolled into Rod Laver Arena for a sold out show last night, filmed for a DVD release later this year. More a mutual respect-fest than a battle of the bands, the only winner on the night was the Australian music lover. 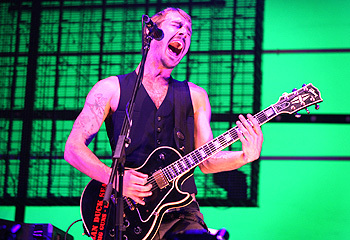 Silverchair's Daniel Johns has developed into one of the country's best showmen. He used his teeth to play guitar and hunched over his feedback pedals like a mad professor to brings the bizarre ideas that inhabit his head to life on stage. They can play the game when needed - Straight Lines is the year's best pop single and the simple, vintage grunge of Israel's Son and Freak tap into the night's more mainstream audience. Ana's Song reminds you of the demons he's overcome and Luv Your Life of his strong voice. Yet they can also detour into experimental epics like the intense Emotion Sickness and the frankly bonkers Those Thieving Birds, a musical tour de force which Johns introduces by noting "sing along if you know it, my hunch is you don't." The noticeable rush to the bar suggested it may have been a touch too left of the middle for some. There's little diversion from straight-ahead rock with Powderfinger. They have the upper hand in crowd singalong anthems - These Days, My Happiness, Sunsets, Love Your Way and On My Mind were all purpose built for large crowds. Frontman Bernard Fanning's powerful, passionate voice was showcased on ballad Nobody Knows and the politically-charged Black Tears, which slotted in well with the night's reconciliation theme. Meanwhile both bands joined forces for a grand finale - The Who's Substitute.